Ever celebrated Chinese New Year (CNY) by savoring your CNY goodies accompanied with Italian wines? On 18 January 2012, UNLV Wine Society (UWS) made this year’s CNY special by organizing an event – Huatitaliano! The event brought members to celebrate the CNY together. It was a unique CNY gathering because we did more than just enjoying the local CNY goodies. Our members got to enjoy their CNY goodies with italian wines as well! Mr. Sandro Giorgi, our guest speaker from the Italian Wine Club, whom is also an italian wine distributer, was invited to share knowledge on his italian wines and how we could best pair our local CNY delicacies with the italian wines. The Italian Wine Club has a portfolio which boasts many exclusive award-winning italian wines. It was an honor to have Mr. Sandro Giogi to educate our members, and to celebrate CNY with all of us that night. A few staff from the UNLV Singapore Campus were also invited to grace the evening. The event started with a presentation by Mr. Sandro Giorgi, which gave us many interesting facts about italian wines. As he moved on during the presentation, there were different phrases where we were asked to drink different wines to match different CNY goodies. We were first asked to taste a red italian wine together with one of the most popular CNY goody Singaporeans adore: Barbequed pork (Bak kwa). Another white italian wine was then poured for members to taste together with CNY goodies that were not so heavy in taste. There were 4 CNY goodies provided for everyone to match their wines with that day: Bak kwa, pineapple tarts, kueh bangit and prawn rolls. The last wine that was poured for everyone, Asti, was the favorite amongst all our participants. It is a sweet wine which is most ideal for beginners. Mr. Sandro Giorgi kindly allowed partipants to purchase Asti – the sale for that particular wine was so good that orders had to be taken and the wines to be collected on another day! 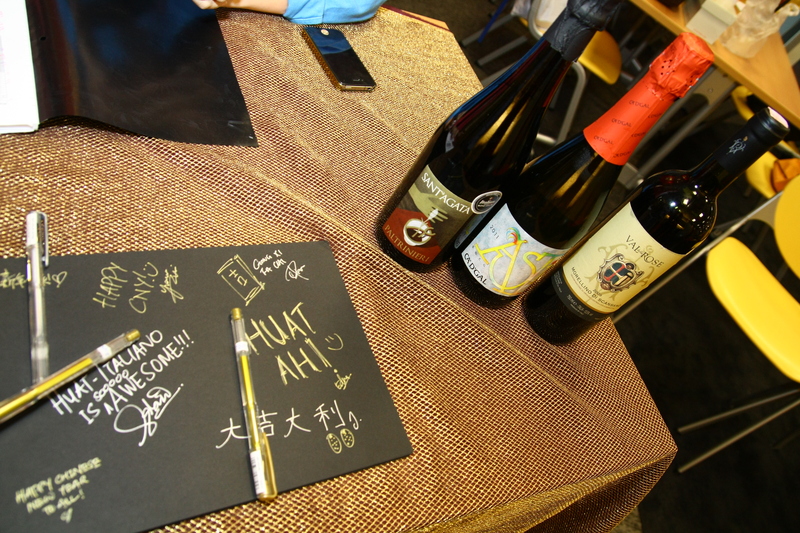 All participants of Huatitaliano had a great fun tasting CNY goodies together with italian wines that day! UWS would be looking forward to organizing more of such events so that members can get together and have fun at the same time. This entry was posted on March 20, 2012 at 1:57 pm and is filed under Uncategorized. You can follow any responses to this entry through the RSS 2.0 feed. You can leave a response, or trackback from your own site.